Every day, physical therapists (PT) and occupational therapists (OT) at VA provide top-quality, personalized rehabilitative care to help Veterans recover from injury, improve mobility and reclaim their independence. 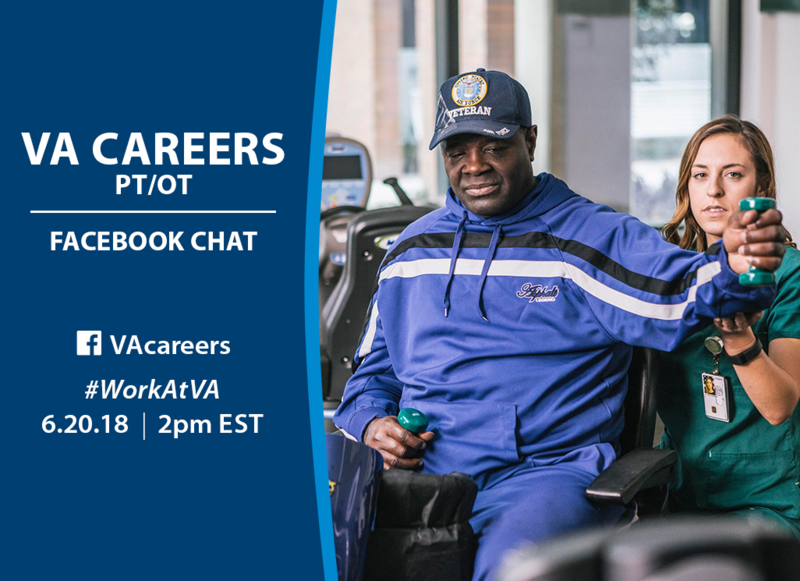 Join us for an upcoming Facebook chat to find out about career opportunities in these fields and how you can help Veterans achieve a better quality of life. Don’t miss out! Recruiters will be on hand to answer your questions about our hiring process and everyday life at VA. In the meantime, learn more about the comprehensive benefits that you’ll receive when you join our team. Think a career giving back to Veterans is right for you? Get started today—forward your resume to our Virtual Recruiting Center at VACareers@va.gov or explore our open positions and apply at VACareers.va.gov. Has the VA considered hiring a medical exercise specialist? I have 13 years of experience in working with rehabilitation of chronic pain post injury. I specialize in most chronic pain conditions and specialize in CRPS. Just a thought! I’ve helped thousands return to a more active lifestyle. Several of my patients have come from post treatment at the VA. I am a patient and a volunteer at Hunter Holmes McGuire VA.